Swedish director Ruben Östlund’s follow up to 2015’s superb ‘Force Majeure’ is a provocative satire set in the contemporary art world, and it impressed the jury at Cannes enough to win the prestigious Palme d’Or. It follows art museum curator Christian (Claes Bang) as he prepares to launch an ambitious new art installation called ‘The Square’, when he is distracted by an elaborate pickpocketing that sees him lose his phone and wallet (but thankfully not his grandfather’s cufflinks). This sets Christian off on a bizarre expedition to get his stuff back which starts to impact on his work at the museum, ultimately leading to a disastrous publicity campaign to support the new installation. It’s another prickly piece of cinema from Östlund that makes for uncomfortable viewing at times, and whilst he does try to add too much to the narrative, I thought this was a really intelligent and daring film. The film sets out to depict the hypocrisy of people, effectively satirised through the art world and the attitudes of the upper middle class and contemporary art patrons, with Christian at the forefront. Claes Bang is really terrific in the central role, managing to make Christian a likeable presence despite an undercurrent of arrogance and distasteful actions and I liked how he was essentially shown to be a walking contradiction with his approach to ‘The Square’ and how its message doesn’t filter through to his own life. ‘The Square’ is so sharp a skewering of modern art that it’s hard to believe it’s not actually real, an installation about humanity that allows the cultural elite to feel good about themselves without actually doing any real good themselves, and Östlund shows this superbly through people’s actions towards those less fortunate throughout. It’s as accurate a film I’ve seen recently about modern society and it manages to do so whilst being incredibly funny and dark at the same time. The marketing campaign that supports the installation and the reaction to it is the cherry on the top and really drives home the point Östlund is attempting to make. Many of the sequences in the film are based on or inspired by real events, including the centrepiece dinner scene featuring Terry Notary (best known for performance capture roles in the recent ‘Planet of the Apes’ trilogy) as a performance artist who uncomfortably blurs the line between reality and art, and it’s simultaneously funny and horrific, but captivating in its entirety. 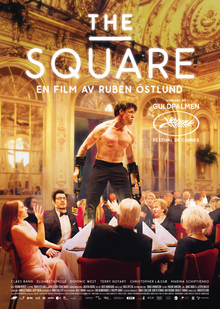 ‘The Square’ is a bold and ambitious art world satire that takes shots at numerous aspects of contemporary society and it’s testament to Ruben Östlund’s writing and direction that it hits the mark more than it misses, and I really enjoyed it.